Da Capo Lifelong Books, 9780738200347, 220pp. A physical, psychological, and spiritual transition that can bring with it the potential for great personal growth and family closeness, dying requires special care and understanding. 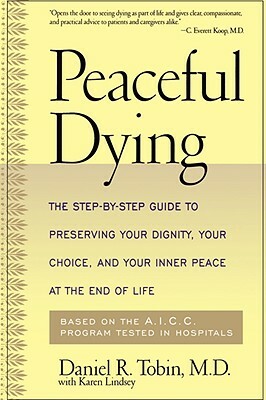 Peaceful Dying, based on the FairCare program founded by Dr. Dan Tobin, presents a 26-step program designed to return control and peace to those who have entered this stage of life and to help all involvedthe dying, their families, and health-care providers alikeappreciate the challenges dying presents. From addressing such formal concerns as creating a living will and pain relief to finding forgiveness, love, and peace of mind, this compassionate and empowering guide will ease our natural anxieties about the end of life, turning this fearful prospect into a fulfilling legacy. Daniel R. Tobin, M.D., piloted the FairCare program for peaceful dying at the V.A. Hospital in Albany, New York. He is now expanding the program to a network of other hospitals and consulting for insurers on end-of-life issues. Karen Lindsey is coauthor of Dr. Susan Love's Breast Book and Dr. Susan Love's Hormone Book.